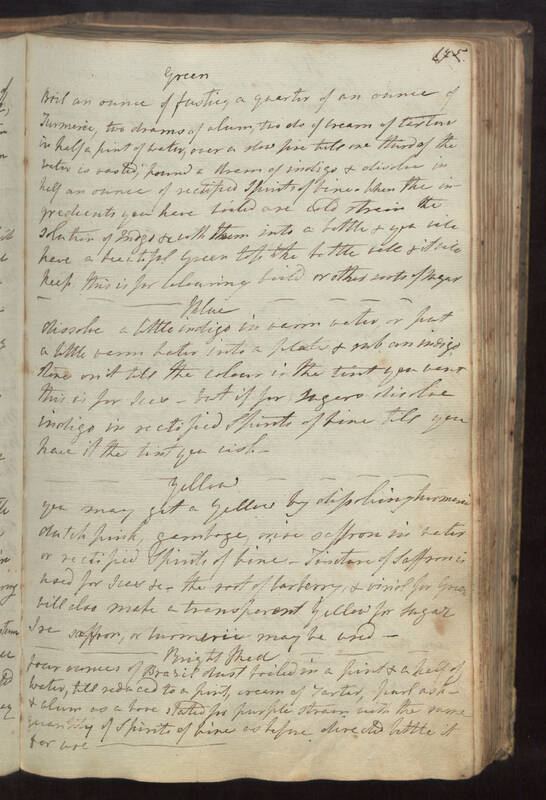 Green Boil an ounce of fusties, a quarter of an ounce of turmeric, two drams of alum, two do of cream of tartar in half a pint of water, over a slow fire till one third of the water is wasted; pound a dram of indigo & disolve in half an ounce of rectified spirits of wine. When the ingredients you have boiled are cold strain the solution of indigo &c with them into a bottle & you will have a beautiful green top the bottle well & it will keep this is for colouring boild or other sorts of sugar Blue Dissolve a little indigo in warm water or put a little warm water into a [illegible] & rub an indigo this is for ices, but if for sugars disolve indigo in rectified spirits of wine till you have it the tint you wish. Yellow you may get a yellow by dissolving [hermenic?] dutch pink, [gernboge? ], orise saffron in water or rectified spirits of wine, Tincture of Saffron is used for ices &c, the rest of barberry, & [viviol for? illegible] will also make a transperant yellow for sugar [illegible] saffron, or turmeric may be used. Bright Red four ounces of Brasil dust boiled in a pint & a half of water, till reduced to a pint, cream of tartar, purl ask, & alum as above stated for purple strain with the same quantity of spirits of wine as before directed bottle it for use.